Many people want to eat fish. Many people also do not want to think that their fish-eating causes the unnecessary deaths of individuals belonging to charismatic or threatened species. However, it is often next to impossible to catch marine fish on a commercial scale without the incidental capture and/or death of at least a few individuals from non-target species – whether they are other fish, albatross, turtles, or indeed porpoises – a problem known as ‘bycatch’. The trade-off we therefore have to make, between catching more fish and killing fewer non-target individuals, which are both noble goals, is something of a tragic one. So how do we make this trade-off? In a new paper , Professor Milner-Gulland and colleagues discuss a systematic approach for managing bycatch in a commercial fishery. The approach is based around a concept called the ‘mitigation hierarchy’. This concept is widely implemented on land (indeed, to some extent it is part of ​a policy applicable to certain development projects in almost every nation on the planet). The idea is that you first predict the biodiversity impacts you think are likely to occur as part of a given activity. Then, you apply the hierarchy itself – sequentially finding ways to avoid, minimise, remediate, and finally offset your predicted impacts – until you are back to where you started (i.e. you have achieved ‘no net loss’ of biodiversity). The implication is that avoiding impacts is most preferable, and offsetting (fully compensating for) impacts is least preferable. Ultimately, the mitigation hierarchy is designed to provide incentives to industry to be open and transparent about the biodiversity impacts they have, and find the best possible way to mitigate those impacts. However, as recently noted by PhD student Nicole Shumway and colleagues, we are still in the very early stages of applying this idea of the mitigation hierarchy in a marine context. The question of how we do so, and in particular, why we might do so for fisheries bycatch, is what Professor Milner-Gulland and colleagues tackle. Imagine you are a commercial fisherman trying to make a living off the coast of Brazil. You catch swordfish using longlines, and sometimes, your gear drags down and kills an albatross, some species of which are Critically Endangered. You can reduce the number of individual albatrosses you kill, but it is impossible to catch fish without killing the occasional bird. The Brazilian Government cannot and will not simply ban you from catching any albatrosses, as that would essentially mean you have to stop fishing entirely. What do you do? Well, Milner-Gulland and colleagues build on previous theoretical work and detail how to apply the mitigation hierarchy to your bycatch problem. They suggest that the Brazilian government require you to ensure ‘no net loss’ for the relevant albatross population, but leave the details up to you. So you, as the fisherman, then have to apply the mitigation hierarchy. You work out how many albatrosses you are likely to catch. You put in place measures to avoid them where possible (fishing only in certain areas, or at night). 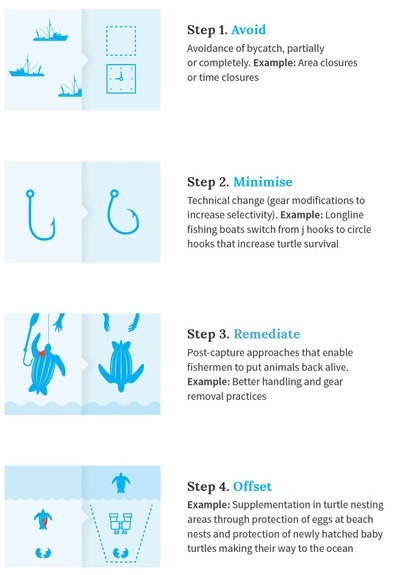 You find ways to minimise bycatch (e.g. by weighting your fishing lines, preventing the birds from trying to get to them). Ideally, at that stage, you find you now catch no albatross – but unfortunately, in some rare cases, you still do. Remediation isn’t really a feasible option in this case, because the birds tend to drown when they’re caught. So finally, you offset: for example, you and your colleagues set up a new conservation programme that vastly improves the breeding rate for the same albatross species, meaning that though you reduce the population by a few individuals through your fishing, you increase the size of the population overall. The mitigation hierarchy framework allows you to do all of this in a systematic, efficient way that can be monitored by third parties. Now, this specific example for seabirds has been suggested before – what Milner-Gulland and colleagues have done is generalise the approach for all bycatch species, using examples from turtles to sharks. Is this different from using the mitigation hierarchy on land? Well, maybe. On land for instance, the focus is on avoiding impacts wherever possible – at sea, there are strong arguments for using the framework to instead seek the least-cost approach. Equally, on land, the uncertainties involved are at least quantifiable (‘known unknowns’, to use Donald Rumsfeld’s now infamous expression) – whilst at sea, we are probably talking about ‘unknown unknowns’. However, in general, the same principles should apply. Of course, all of this is somewhat controversial, not least as some perceive the approach to be a way of licensing fishermen to kill otherwise protected species, however they see fit. Furthermore, unless there is very good enforcement of the approach, and a high level of transparency, it is unlikely to prove effective in reducing bycatch. Both are valid concerns in practice, even if the mitigation hierarchy is designed in principle to avoid both of these problems. Crucially, what the mitigation hierarchy approach offers (that no other approach does) is a balanced and systematic way for tackling what is otherwise an intractable conflict: between the desire to eat fish, and the desire to protect all individuals of non-target marine species. At the end of the day, the entire point is to enable fishing whilst preventing those fishing activities that involve bycatch, wherever that is genuinely possible. If we can achieve that, then the Mock Turtle from Lewis Carroll’s ‘Alice’s Adventures in Wonderland’ would be proven correct after all: and the wise fish always would ensure they travelled with a porpoise.